We are monitoring a threat of severe weather on Monday. Severe thunderstorms may impact East Tennessee with damaging winds, large hail, heavy rain, and isolated tornadoes. The Storm Prediction Center has placed part of the region under a “Slight Risk”. NAM model showing a line of storms approaching the region at 8 pm Monday. Severe weather will become possible starting around late afternoon. 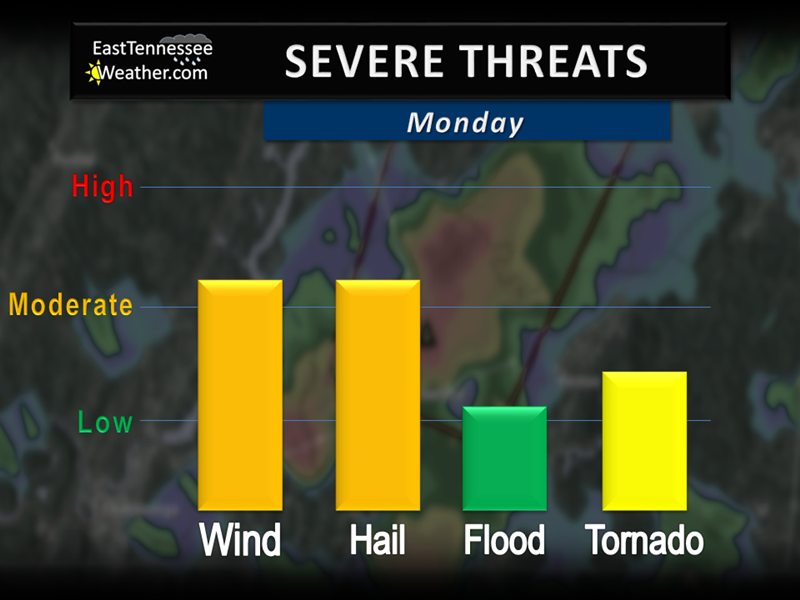 Forecast models indicate the possibility for a few strong to severe thunderstorms Monday afternoon and evening. While these storms may pose a threat, it appears the main threat will be a line of storms that will progress southeastward through eastern Kentucky into the Tennessee Valley late in the evening. Models suggest this line approaching the region after 8 pm. Although severe thunderstorms are possible across the entire region, locations north of the I-40 corridor will see the greatest risk. The SPC has placed the northern half of the region under a “Slight Risk”. This includes the Tri-Cities, Knoxville, Oak Ridge, Crossville, Cookville, La Follette, Morristown, Oneida, and Sevierville. Slight Risk (yellow) for the northern half of the region. The “Slight Risk” area also spans northern Middle Tennessee, most of Kentucky, Southwest Virginia, southern Ohio, and western West Virginia. Cities like Nashville, Lexington, Louisville, and Charleston are included in the risk area. Main threats include damaging wind and large hail. Isolated tornadoes also possible. All modes of severe weather are possible. The main threat is damaging winds in excess of 60 mph. Large hail over an inch in diameter is also possible. Isolated tornadoes cannot be ruled out. Storm may also produce heavy rainfall, which may lead to flash flooding. As always, there is a certain level of uncertainty regarding the severe threat. This time, the uncertainty i based on how much storm activity we see prior to the arrival of the main line of storms. If we see a bunch of thunderstorms during the afternoon and evening, this week destabilize the atmosphere and decrease our chance of seeing severe weather. This will also be the case if the early storms leave a bunch of cloud clover in their wake. 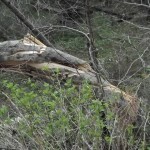 As always, the EastTennesseeWeather.com team will continue to track this developing situation and will keep you posted. For up-to-the-minute alerts and updates, follow us on Facebook and Twitter.